The special was hosted by former ABS-CBN host and now network anchor Cher Calvin, and aired live for three hours. ABS-CBN reporter Yong Chavez, Billy Ray Cyrus (father of popstar Miley Cyrus), and Consul General Hellen Dela Vega were among those who appeared in the special. 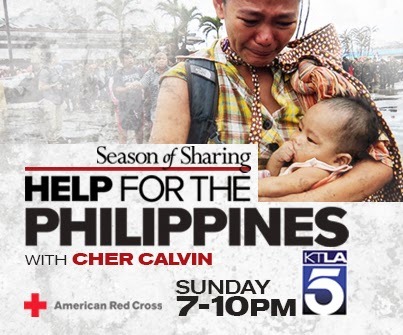 In an interview with Chavez for TFC's Balitang America, it was mentioned that Calvin, a Filipino known for her stint on the 90s lifestyle show F, brought the idea of doing a special to her station manager at KTLA. "It's not just a Filipino thing, but a human thing. But I think most of all because I am a Filipino. You know when I saw the devastation and I pictures came out of Tacloban, I felt that there was something I had to do," Calvin said. The telethon has raised more than $150,000 so far. You can still make a donation through KTLA's website -- www.ktla.com. Where are you watching the coverage of the aftermath of Typhoon Yolanda (Haiyan)?